A quick post to summarize past week's movement on FKLI & FCPO. Past week close below 1,700 for consecutive two days appeared to be a false alarm. Price quickly reverse after it & continued upward, overcame 1,710 resistance & subsequently made a new high at 1,720.5. Today saw an inside bar formed, we shall see which direction it will breakout to tomorrow. In the mean time, I'll watch the uptrend line extending from previous significant low of 1,585 closely, as its violation may bring about a furious plunge, as those seen in Nov'12 & Jan'13. FKLI has been stuck sideways within the 1,600-1,700 range for 7-8mths since early Sept'12. I put up a 10yr chart on our index futures & marked out major trends defining the past decade of FKLI history. 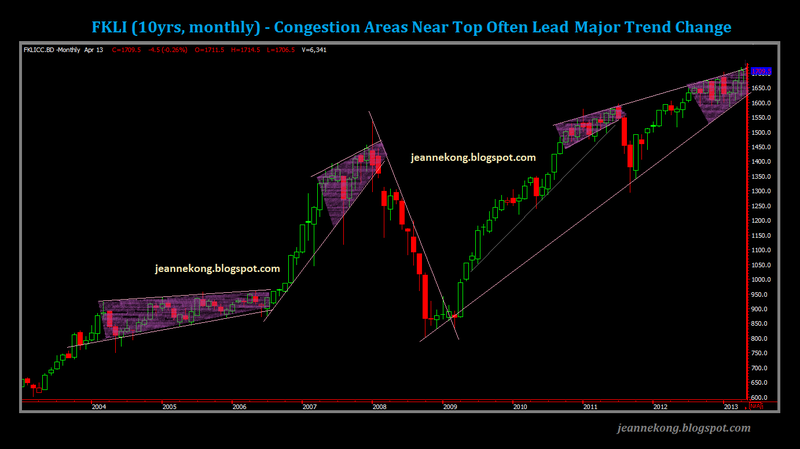 Notice how congestion areas (shaded in magenta) near significant tops (then all-time highs) has shown tendency of signalling prominent trend change ahead. Also, notice that the climb from Sept'11 low of 1,295 to current height above 1,700, it forms a rising wedge pattern. In fact, the whole post-subprime bull run, from 800 low to current, is itself a huge long-term rising wedge, where the top of it passes through subsequent all-time highs of 1,535 (yr 2008), 1,580 & 1,597 (yr 2011), and the latest 1,705 & 1,720 (2013). Wedge patterns, or ending-diagonals as regarded by Elliotticians, are often found at end of motive cycle (Wave 5 or Wave C; in upward & downward moves), especially those where the Wave3 has risen too fast & too far (i.e. extended waves). We now have a coiled-Ending diagonal (the best way to describe it that I can think of...lol), one within another, on two different degrees (Cycle & Primary) of the Elliott Wave hierarchy. In plain terms, we are near end of the post-subprime bull run, which at the same time, represent the end of a Super-Bull market which could well backdate to the post-Asian-financial-crisis low of 265 (Sept'98). From previous low of 2,250, price rebounded strongly back to 2,305-2,315 area. 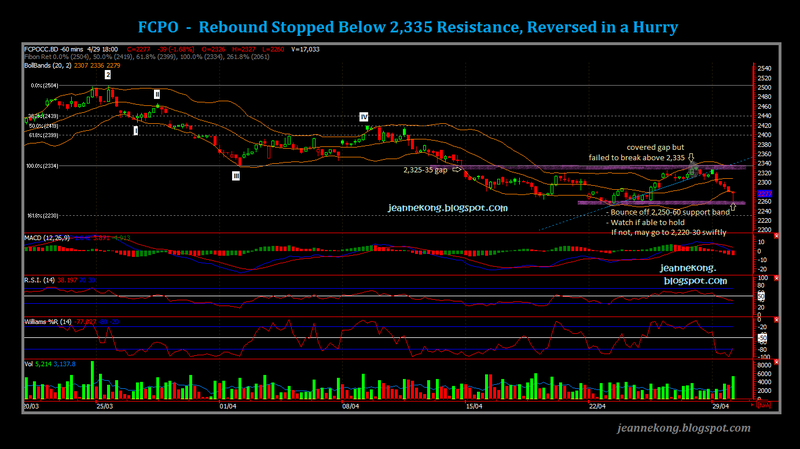 Later, it broke above the 2,315 resistance & rise swiftly to cover the 2,325-2,335 gap (Apr15). 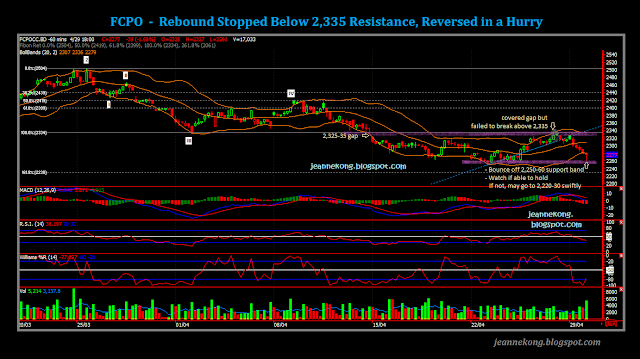 However, Bulls hesitated at 2,334 high, Bears thus confidently stepped in & press price back down to 2,315. Today, Bears took it another level down to below 2,300 & 2,280 support, touch intraday low of 2,260, below short-coverings brought price back up to close at 2,277. A long red formed on the daily. The 2,250-60 support band may continue to hold, as a pin bar formed on the 2,260 level as sellers cover their positions in last-minutes of trading. Shall it fails to hold, we shall see accelerate drop to find the major support band at 2,220-30, eventually. I shall update on GOLD in my next post, within this week. In the mean time, I'll come back to FKLI & FCPO after 050513 GE13 Polling Day. Drive safe, as you head home to vote. Needless to say, we know which coalition we are voting for...If you're still not sure (for some real weird reason :p), just take a tour around FB & you'll no doubt be darn clear where you'll 'X' on that ballot paper on May05. See ya'all after The Change! I would like to check with you where do you get those FKLCI charts that you use for posting. By the way you had done a nice job on your Blog. Have any idea where FKLCI is heading? My take is KLCI will continue to move higher or at least to maintain at current level for the time being. MY short at MAY future was taken out this morning, suffered a loss of 40 points. Yup. Many shorties got caught. Technically, if its able to close above 1720 today, its back above the uptrend line again after last Fri's breakdown. However, I'm taking today's anomaly with a pinch of salt. On the daily, we are now looking at a MEGA-shooting star. If tmr we get a lower open & further retracement to below 1,720 mark, we can expect today's action a mere super-washout to squeeze out majority of shorties. Pretty hard to comment on wild swings on GE13 result announcement day, especially one that's so blatantly manipulated. 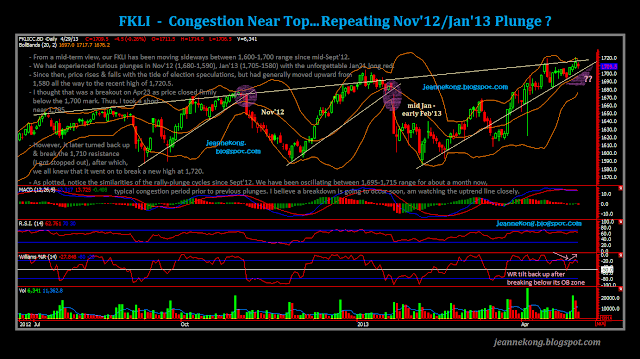 This week's action shall tell us more of the near term market sentiment n direction. Keep the faith, both on your trading confidence & on our nation's democracy! Counting down 21days for GE13 result appeal.